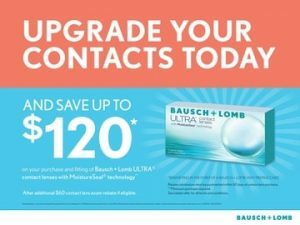 Research performed by Bausch & Lomb in August determined that many people regularly use dangerous substances instead of lens solution to keep their lenses moist. Substances including baby oil, beer, coke, petroleum jelly, fruit juices, butter as well as others were all listed as occasional substitutes, by 20% of the 2,000 adults surveyed in the survey conducted in the UK. An even more worrisome number of the respondants reported that they have used spit when putting lenses in their eyes. Knowing that the typical adult mouth is known to contain 500 to 650 different types of germs, this can pose a serious health risk to your eyes. Further, an alarming number of people presume that water from a tap or bottle is a safe replacement for contact solution, however even those can contain microorganisms that can damage the eye and have been associated with Acanthamoeba keratitis, a sight-threatening infection. In fact, if you get water in your eyes from a pool, ocean or even a bath while your contacts are in, it's advised to remove your contacts as soon as you can and thoroughly rinse them to rinse away any microorganisms that may have adhered to them. The only fluid that you should use to wash, cleanse, lubricate or soak your lenses is approved contact lens solution. Never keep your contact lenses in water! Keeping contact lenses in water does not sterilize them and harmful fungi can gather on your lenses almost instantly and eventually enter your eyes. Further, contact solution is balanced to match the acidity of the tear film in your eyes and water on the other hand can cause discomfort or blurred vision since your lenses may stick or change shape. When you know that you do not have the means to properly disinfect your contacts, you should definitely use daily disposable contact lenses instead of lenses that you reuse. It's imperative to take age, way of life and level of maturity into consideration when determining which contacts are best for you. Before trying out your first pair of contacts be sure to learn with your eye care professional the proper way to care for and store them. Only those who can understand how to properly care for contacts and how important this is should wear contact lenses, particularly reusable brands. Failure to do so can result in irreversible eye damage, vision loss and even total blindness!